Pop some bottles of champagne for these Champagne Bites. They’re just what the adults want for the holiday season. 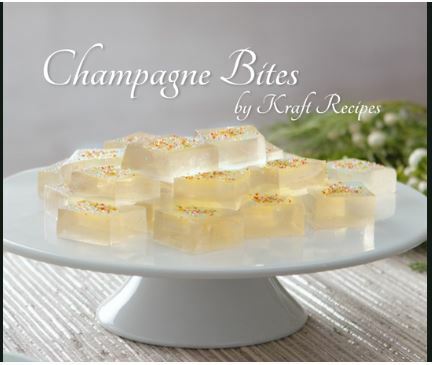 Make these Champagne Bites for your next party, whether you’re celebrating a birthday, New Year’s Eve or just because! 1 – Combine gelatine and granulated sugar in large microwaveable bowl. Stir in wine. Let stand 3 min. or until gelatine is softened. Microwave on HIGH 3 min. or until gelatine and sugar are dissolved, stirring after each minute. 2 – Pour into 8-inch square pan sprayed with cooking spray. 3 – Refrigerate 3 hours or until firm. 4 – Dip bottom of pan in warm water 15 sec. Unmold gelatine mixture onto cutting board. Cut gelatine into 5 rows, then cut each row into 5 pieces. Top with sprinkles. Tip 1 – Substitute parkling grape juice for the champagne. There’s a really short video to watch so be sure to CLICK HERE to head over to Kraft Recipes for all the nutritional details and info. These little goodies are a favorite of both the Bee Dubyas (the Barron Wives) AND the Moonstruck Mates. Hannah says even she can make these. The Mates send the kids off with the Wolves, make several batches of Champagne Bites and settle in with a good movie. Like…”John Wick.” Or “Last of the Mohicans.” If you’re interested in finding out what happens to all the original Moonstruck Wolves and their mates, grab MOON SHOT. It’s free to read with a Kindle Unlimited subscription, and not all that expensive to buy your own copy to keep. If you’re new to the series, you really want to start at the beginning because MOON SHOT is pretty much the Happy Ever After of ALL the Happy Ever Afters. Just click on the bookcover and zip on over to Amazon. This entry was posted in Writing Life and tagged #KindleUnlimited, Amazon Kindle, books, characters, food, fun stuff, holiday, inspiration, links, Moonstruck, reading, recipe, Red Dirt Royalty, series, Tuesday Treats, video. Bookmark the permalink. I would’ve been so into these once upon a time.